Saute Ma Ville. Directed by Chantal Akerman, 1968. Selina Robertson is the co-founder of Club des Femmes. She is a feminist film programmer and writer, and is currently researching the history of feminist film curation and programming in London. 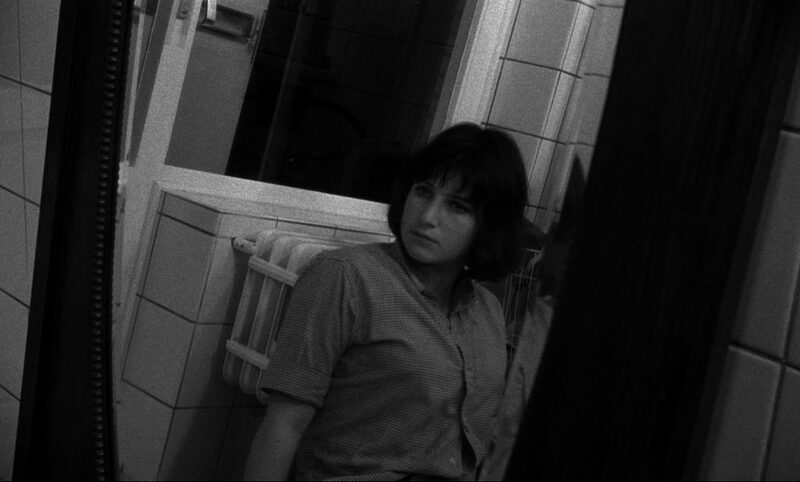 I’m writing this on the last day of June, the month of Chantal Akerman’s birth; born in Brussels on 6 June 1950, she would have been 68 this year. In 1968, when she was just 18, she made Saute Ma Ville (Blow up My Town), her first film. Akerman dropped out of film school and cast herself in this scathing parody of the domestic, compressed into three tightly edited scenes. François Truffaut’s Les quatre cents coups (The 400 Blows) is decimated in one manic hum; she dances, she laughs, she revolts, she reflects in the mirror and then: BANG. Her experience of film school in Brussels was an old boys’ network; so she left. ‘I was born in Brussels and that’s the way I see things – frontally and straight’, she said. I remember being shown Les quatre cents coups in my French A-level class, together with reading Marcel Proust, Guy de Maupassant and Jean-Paul Sartre; I was taught the male French literary cannon. I remember thinking: where are the women intellectuals, filmmakers, and artists? Later at university I read Simone de Beauvoir and Monique Wittig. I studied Linda Nochlin’s essay ‘Why Have Their Been No Great Women Artists?’, and was shown Maya Deren’s Meshes of the Afternoon (1942), but still no Akerman. I came to Akerman in the mid 1990s via Jeanne Dielman, 23 quai du Commerce, 1080 Bruxelles. I had never seen a film about the boredom and madness of being a housewife, which in 1963 Betty Friedan called ‘the feminine mystique’ in her bestseller of the same name. I later discovered that Saute Ma Ville, shot inside Akerman’s Brussels tower block flat, preceded Jeanne Dielman by 7 years. B. Ruby Rich wrote about Akerman’s early works as ‘films of correspondence’, films that investigate correspondences between affects and objectivity, art and ideology, continuously folding the author within the text. Saute Ma Ville begins with establishing shots more frenzied than explanatory, as sound and image shoot up the side of the tower block, the lift, the stairs and land – as if in one breath – inside her kitchen. Every action in the film counts: cooking, eating, humming, brushing, dancing, laughing, washing, cleaning and taping; this is furious feminist work. ‘I always did what I liked and what interested me,’ Akerman said. Patriarchy, repression, depression, subjectivity, wilfulness, revolt: she ripped up the master’s tools. Akerman changed the way I saw cinema, she showed me a way out. My favourite moments are when she bats her eyelashes at the camera. She is only 18, and she will change the world.